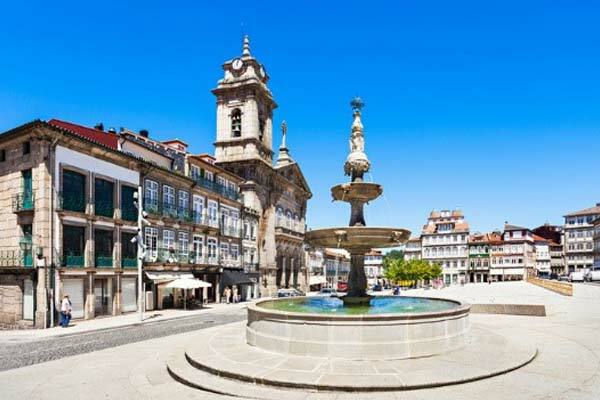 Guimarães: "The Cradle City of Portugal"
The former Roman city of Guimarães was chosen by the first king of Portugal in 1128 as his administrative base. Today it is designated a UNESCO World Heritage Site. The city is one of the most popular day trips from Lisbon and draws tourists from around the world to visit sites like its 10th-century castle. Not much remains of the castle, but the ramparts and tower areas offer sweeping views of the town below. Visitors also come to see the Ducal Palace with its distinctive, tall, red-brick chimneys, built by the first Duke of Braganza between 1420 and 1422. Designed in the style of a French château, it is graced with stained-glass windows, painted ceilings, finely carved antiques, and spectacular tapestries. Despite its historical attractions, the population of this very Portuguese city of 52,000 goes on about its workaday business, creating an interesting blend in the general tone of the city. In part because of tourism, you’ll find shop and restaurant owners who speak English. The younger generation is taught English in school, and there’s a university in town, which attracts Erasmus students from all over Europe and the Far East. 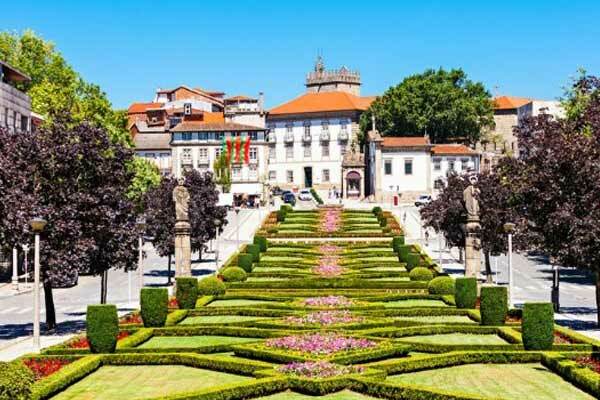 Add a modest number of British, American, and other expats, and the active group InterNations in nearby Porto (35 miles to the southwest), and you’ll find it easy to make connections. Summers here are short, warm, dry, and mostly sunny, while winters are chilly, wet, and partly cloudy. Over the course of the year, the average daytime temperatures typically vary from 41 F to 82 F, although extremes can make the mercury dip below 32 F or rise above 92 F.
Guimarães is a walkable city, if a bit hilly. Descending the slopes of the castle area, you arrive at narrow, twisting passageways between stately granite buildings and pleasant squares like Largo da Oliveira, named for the majestic olive tree growing in its center. Here you can while away time and people—watch at any number of outdoor cafés. Every historic district in Portugal has its share of impressive convents and churches, and Guimarães is no exception. These, together with grand homes trimmed with wrought iron balconies, Gothic arches, and treasures like the Alberto Sampaio Museum offer a feast for the senses. Shoppers will find all they need here, between GuimarãeShopping, Centro Commercial São Francisco, and Espaço Guimarães, in addition to small stores and markets dotted around the city. The reliable public bus system offers transportation around town, and even to France and Spain, while the train goes to Porto, Lisbon, and elsewhere. Taxis and Uber are also available to take you around if you opt not to own a car here. Largo da Oliveira is considered by many to be the heartbeat of the city, a place to sip coffee and dine at leisure in a relaxing atmosphere. It is also where film festivals, art events, and concerts take place. You may even be treated by an elder statesman, a local who occasionally performs live in the plaza, to the delight of passersby. The weekly market on Fridays behind the castle is an excellent place to pick up goods, socialize, and let the realization sink in that life can, after all, be stress-free. “One’s man’s junk is another man’s treasure.” The adage is true, and Feira de Velharias proves it. In fact, this flea market is frequented by antique collectors from around the world. On the first Saturday of the month, local residents bring their unwanted items for sale: old, handmade toys, paintings, old magazines and rare books, and jewelry and vintage clothing. 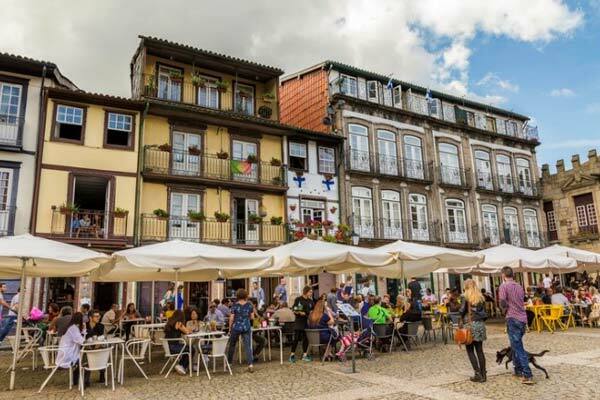 The cuisine in Guimarães is weighted toward the Portuguese (pork, beef, fish, and seafood), but living here means also dining at pizza, pasta, sushi, and more. If you’re a regular reader of International Living, you already know this: You can travel around Portugal from north to south and west to east, to large-, medium-, and small-sized cities and enjoy a three-course lunch of soup, main dish, and dessert with beverage for somewhere been $8 and $12. The same is true here. Of course you can always spend more on a meal. Cozinha por António Loureiro is located in the historic district and offers pre-fixe menus ranging from $60 to $90. So, now you also know you have an option to celebrate a special occasion if and when you visit or move to Guimarães. The following is a breakdown of monthly costs for a couple, based on recent real estate and general budget listings.